Whale Watch offers outstanding views of Haystack Rock. Located within easy walking distance to both mid-town and downtown shops and restaurants, Whale Watch is an exceptional multi-level property, a combination of breathtaking views and outstanding amenities. On the upper level, this contemporary home features a chef's dream kitchen, with granite countertops, gas range and oven, and a spacious zone for creative cooking. The informal, open-plan kitchen and dining room create an optimum gathering spot with seating for all. The spacious main living room flows a few steps down from the kitchen and dining area, and it's the perfect place to relax in front of a gas fireplace while you take in those amazing ocean views. 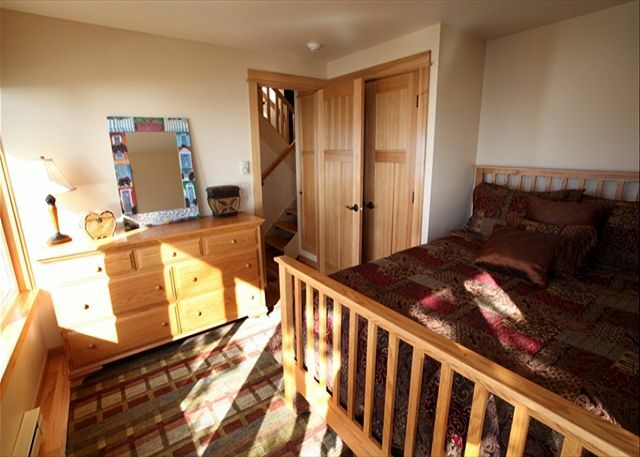 An ideal getaway for groups or families, the many levels in Whale Watch give privacy to all three bedrooms. The upper level master suite with Queen bed is an expansive retreat with dramatic views, a gas fireplace, sitting area and private deck. The master bathroom boasts a leisurely soaking tub and separate walk-in shower. 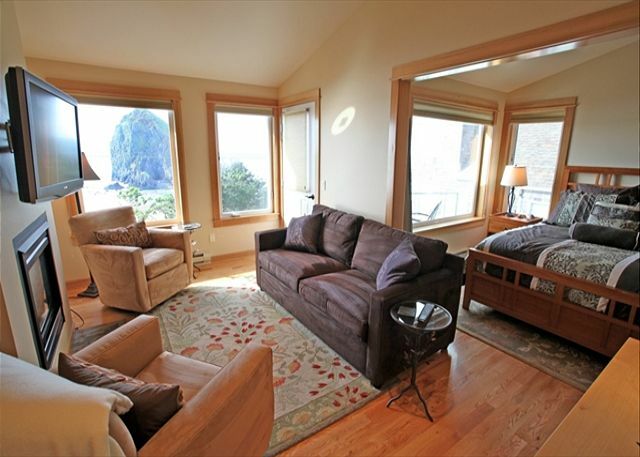 Two additional beautifully furnished Queen size bedrooms offer one of-a-kind views of Haystack Rock. One bedroom, bathroom, and laundry area with full-sized stackable washer and dryer is tucked off the mid-level stairway, while the other bedroom is located on the entry level floor along with a cozy den, which includes a hide-a-bed. While the interior features large window ocean views, the ample deck in the back is perfect for private outdoor grilling on the gas BBQ. "Peace and quiet and fabulous views"
Thank you for choosing CBPM again this year Andrew, it is always our pleasure to have you. 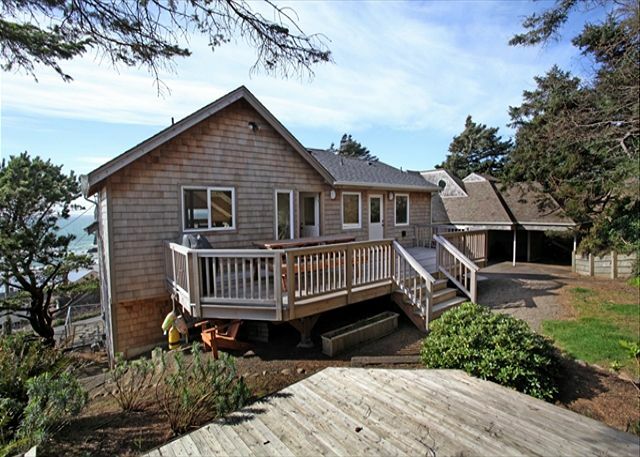 "Beautiful home in front of Haystack rock, two young families enjoyed a wonderful long weekend in the home. The open concept provides a great layout for families. The master suite was wonderful and inviting. The gourmet kitchen was perfect to cook in. All in all a great home to rent." 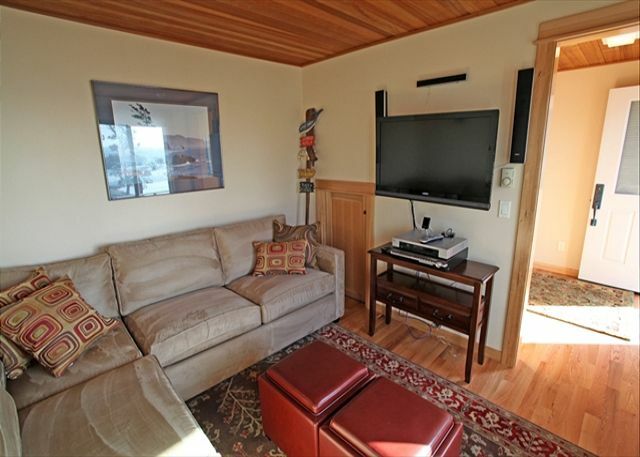 "Lori and I had a wonderful time staying in Cannon Beach, and the house was great. What a fantastic view! Lori and I both felt very much "at home" during our stay. The home had all the amenities we needed, plenty of guest rooms for the visiting family members, and a great kitchen large enough for all. We celebrated Christmas and New Year's in the home and fun was had by all. It was difficult leaving." 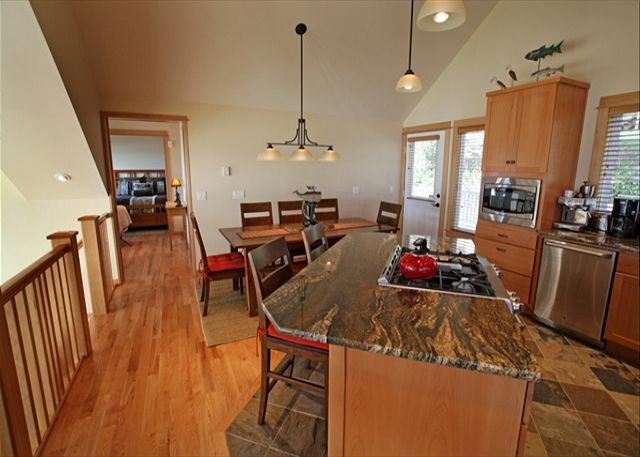 "This has got to be one of the best rental properties anywhere in Cannon Beach. The view is unparalleled. Close to town (and walking distance to the best coffee shop and restaurant in Cannon Beach - Sleepy Monk and The Irish Table). Very clean and modern interiors. Great amenities. 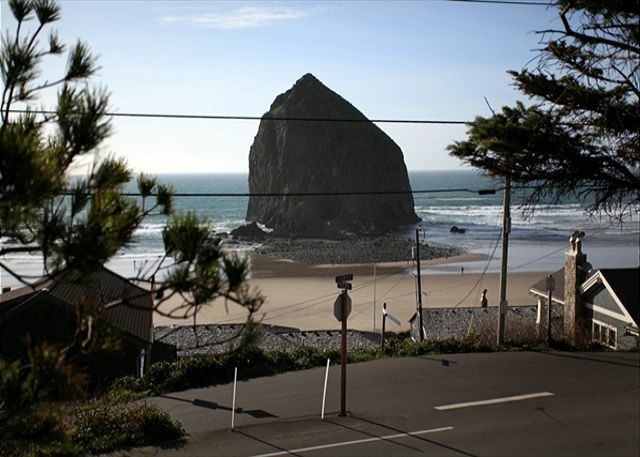 I have been coming to Cannon Beach for 24 years, and this is my favorite place I have stayed." "Great home with fantastic views of the ocean"
"It was incredible and we highly recommend it!! The home is beautiful and comfortable. Such an easy walk down to the beach and so accessible to the water. Thank you so much!!" "Great Town, Great Scenery, House location and beach access were as good as it gets..."
We did find that there was a shortage of mirrors when all six of us were trying to get ready to go someplace in the mornings. A big mirror in the master bedroom bath would be nice. But this did not hinder us from having a fabulous time. Thank you for sharing your home :)"
"We came to canon beach as a memorial for my wife who died 2 months ago. Canon beach was her favorite place on earth. I hope your place is available again when we came back as a memorial event.Thank you." "We loved the house and had a terrific one week stay in April 2013. You can't beat the view and the very easy access to the beach and Haystack Rock was fantastic. The house had just about everything we needed and is in new condition. We look forward to returning to Whale Watch in the future." "This was a great house - very clean, updated and great views. We enjoyed the binoculars and telescope for Haystack Rock viewing. Beach was very accessible and loved all the outdoor seating on the back deck as well. Very comfortable and nice to have some separate living areas with the different levels." "This home is a great vacation home. Great views, nice location except the steep driveway. Top of the line all the way." "Whale Watch is a great house and I look forward to my return. " "Stayed at Whale Watch for the week with our wedding party and the house was great. Had a hiccup with another property that we had originally rented becoming unavailable and CBPM handled it in a professional manner to ease stress and make sure we were taken care of. One quirky thing about the house is that there is not a ton of privacy for the master bedroom on the main floor unless you close off one of the two community bathrooms as well -- that said the master bath is heavenly and was amazing for a wedding couple. 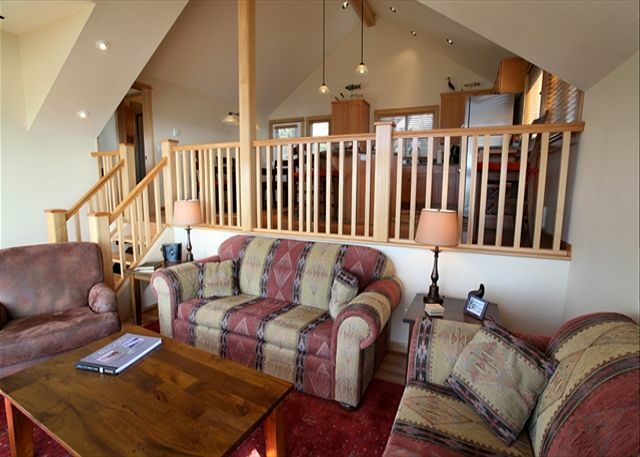 Views of Haystack from most every room are great and it's a quick walk down to the beach. Highly recommend Whale Watch for 6-8 people!" "We had an incredible time with family and friends at Whale Watch in Cannon Beach! Amazing views and a beautiful home! We made huge meals in the kitchen and spent a lot of time on the balcony watching the sunsets. " "Had a great vacation. Enjoyed the views and the great kitchen!" "What a wonderful vacation house! The weather gusted and stormed while we were visiting Cannon Beach for the Thanksgiving holiday; however, the wonderful views from all floors of the house and warm fireplace kept us cozy and content. We had a wonderful experience with Cannon Beach Property Management, and are hoping to return to stay in the Whale Watch House again. Absolutely no complaints!" 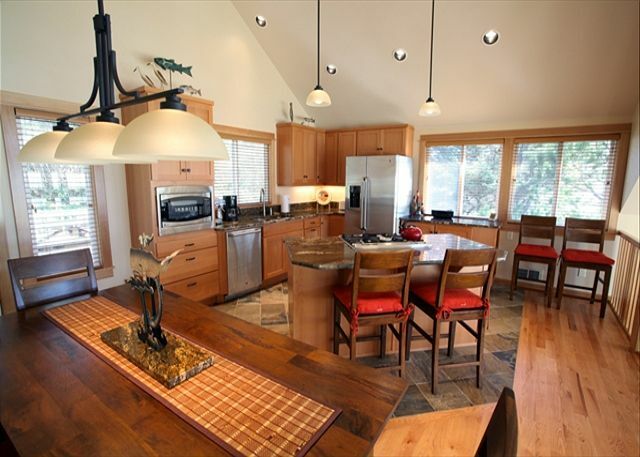 "Whale Watch is a great vacation rental for small or medium sized groups. We highly recommend this rental to anyone who is looking for a high end rental. "Spent a week at this beautiful home with family. Location and view top notch. Recommend to others." "The views of Haystack are unmatched. The property just finished a beautiful remodel in March 2011 and the house itself as well as the furniture and decorations are very nice. The kitchen and layout make for a great cooking/dining experience. From virtually any room in the house, the view is incredible. The dining room table seats 8 and there is a nice bar seating area at the kitchen island as well. Very large (new) deck on the back of the house that has peek-a-boo views of the ocean and peaceful sounds of the waves. For cooking, there is a barbeque as well as ample oven and gas range cooking space. Solid surface countertops, new stainless appliances, hard wood and tile floors etc. What a beautiful place! The main living room, which the kitchen looks over, was such a spacious/comfortable place to sit and relax. Two nice ~42 inch flat screens conveniently located in both the upstairs and downstairs den areas. Once you are parked at the property, it is a nice short walk to either mid town or down town. A couple of issues worth noting would be the stairwell in the home and its appeal to tumbling toddlers and the difficulty crossing Hemlock road. The driveway is quite steep and enters Hemlock on a slightly blind corner. 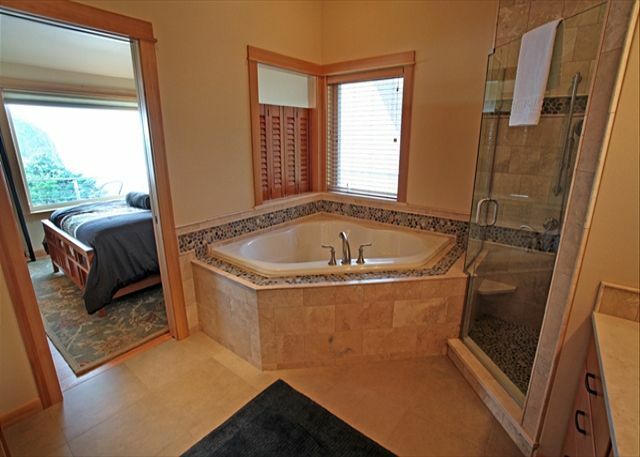 All in all a wonderful home that I would recommend as a great place to soak in the views of Cannon Beach. "We loved the Whale Watch house with its smashing views of Haystack Rock, Pacific, beach and sunsets and its quiet protected garden with deck and beautiful flowers in back. The many levels in the house gave privacy to all three bedrooms. It would not be a good place for those in wheelchairs or on crutches or those with bad kneews. 1 bedroom needed a second very narrow bedside table. We had stayed at the house just above it many times, and some family members had stayed at the house next to that one. The worst thing about the house was the very tricky turn on to S. Hemlock and the return back into the driveway and carport. Shorter, small cars are better. We rented it with our daughter, her grown daughter, and had visitors from our son's family, including especially his 25-year old son. We played games at night, such as Call Pitch and Settlers of Catar. On this grandson's last night, we all tried to invent reasons why something wold occur so we would all have to stay at the Whale Watch house for 2 or 3 months and could not get out to go back to work and school. Everyone walked on the beach and some swam, surfed and boogie boarded. Some wore wet suits, some didn't. Son and his daughter came down the last night. Access to the beach requires some agility and stamina, but my husband and I were able to do it with some assistance from younger family members. I carred a walking stick. The steps had good rails, though. It would have been easier to keep track of each family mamber's towels, if the colors had been more distinct and different. For us, it was a great and extremely enjoyable vacation beach house. " "The house and the view are both wonderful, and I would love to stay there again. My only hesitation is the driveway, very steep and scary to drive out of, as the visibility in both directions is limited. But the view compensates!" "We really enjoyed our stay at this house. The view of Haystack and the beach is one of the best around! Loved the layout of the house with bedrooms on multiple floors - plenty of room for our two kids to have their own space and for our dog as well. Only negatives would be the driveway since it's a blind curve at the bottom so it's tricky to get out with the car and dangerous crossing Hemlock with the kids, dog and beach gear. The upstairs windows need to be fixed so they can be opened to provide ocean air to cool down the house but maybe that will be done with the updates happening in the fall? Overall, we loved the house and had a great stay!" "(cont'd) reasonably. On checking out, I was disappointed to hear it will be remodelled (although it is a bit dated so I can see why) because the value was so good I wanted to book a trip this winter." "This was a comfortable home with a great view. The driveway was difficult to navigate and turning on to Hemlock was awkward with poor visibility. With six adults, having only one shower was somewhat problematic. It's a very good rental for the money." "Somehow we missed the fact that there were four levels making it hard on the knees, but the view was worth it. Comfortable beds and plenty of seating. The backyard looked very inviting for warmer weather. We had a great time. Thanks for allowing us "out of towners" the chance to enjoy the use of your home." "Location great. Only one thing I would mention is the very steep drive having two cars it was a little difficult to turn round to get back out of the drive. Staff very good. except for some dirty dishes"
"Great view. Even made the rainy days enjoyable. Easy access to Haystack Rock and the Marine Garden. Perfect set-up for traveling with kids. " "You can't beat the view from this location. It is not on the beach, but you almost feel like you are there because of the fantastic view. The walk down to the beach is short and very manageable. You can see Haystack Rock in all of its glory. With a pair of binoculars, the low tide is practically in your living room. We loved that we could take our dog along, and that there was even a small backyard so he could go out when he needed. The driveway is a little tricky to get in and out onto the occasionally busy road below. The amenities were all there and in working order. Our daughter especially loved the latte machine! The flat screen TV and surround sound system was a delightful surprise. The only thing I would like to see added is a gas BBQ. It would make dinners a lot easier for those of us who are not used to using the charcoal variety. Aside from that, we would readily consider returning to this property on our next visit to Cannon Beach." "We had a very nice stay....thanks for bringing the BBQ grill over...looking forward to our Thanksgiving stay!" "We've stayed at this property several times with our golden retriever. Fabulous view. Good beach access. Very comfortable. Linens could have used updating, but maybe that's happened by now. Only negative experience was when the City was jackhammering for repairs right at the driveway, but that's not the fault of the property owner, and the property manager facilitated a transfer to a different property."